Nature walks don’t need any greater objective than enjoying the out of doors. When you and your children are savoring the sky, the plants, the insects, and the wildlife, there is no need for a lesson plan or script. However, there are an abundance of things you can do as a springboard or a follow up to a nature walk in order to enrich the experience. I share these 100 ideas not to detract from the healing beauty of nature but to offer some zest when nature walks are becoming too routine, when you have children who might be reluctant to go out of doors, or even when you need a bit more academic tie in for whatever reason. Nature needs no embellishment. And many of these ideas come from the innate fascination children (and adults) will experience when they turn off the electronics and use all five senses to experience nature. If making leaf crafts doesn’t come automatically to your children, you may need to offer a slight nudge to get the ball rolling. But by all means, don’t turn these activities into strict lessons with educational objectives. Let them be methods of exploration that take their cues from your children’s curiosity. Build anticipation for the nature walk with these activities. make a nature walk backpack or tote with things like a journal, magnifying glass, binoculars, bug catcher, etc. Most children will come up with their own ideas for play, but if they need a nudge, here are some great ideas. 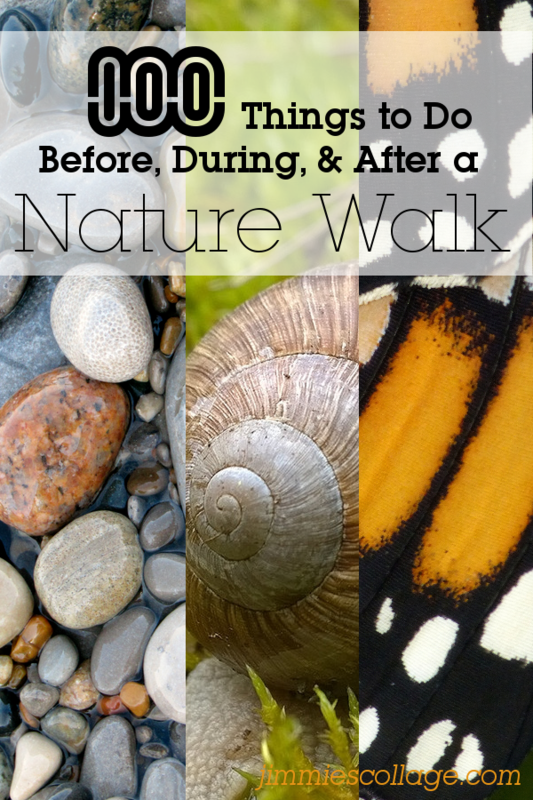 Once you are back home, extend the nature fun with these post-nature walk ideas. 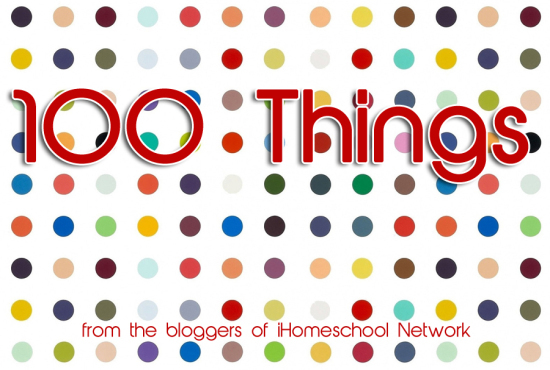 There are lots more 100 Things posts. Click the image to see the other topics. Jimmie – This is not only very informative but it’s beautiful! I love the graphics you created! I LOVE this list! It makes me want to go run outside with my kids and do some nature study right this minute! Do an alphabet hike in the woods. Carry an index card with the alphabet written, mark off each letter shape you find in vines, leaves, bark, branches, etc. The letter “V” is the easiest, of course. Oh my! I was such an outdoor kid. I am ready to go outside reading this list! Great ideas! We made a little scrapbook out of paperbags with the bottoms cut out and folded and stapled. We made little papers to insert in the pockets. Then the kids collected whatever they wanted, sketched them and labeled them and later decorated them with some pretty papers. The girls loved it! This is wonderful. I am so grateful for this post!!!! What a WONDERFUL, insightful, and beautifully presented synopsis on Nature Walks! Thanks so much for sharing! This is very helpful, and has a lot of fun stuff, I love using this and I will definitely do about everything on here, YEAH! !